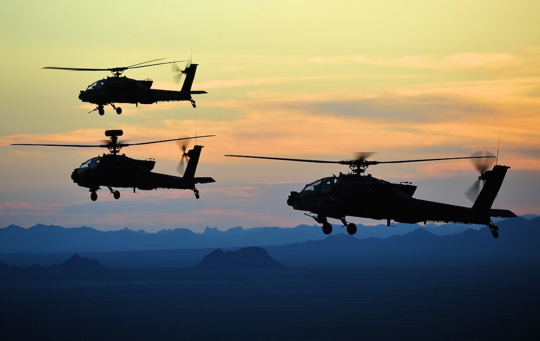 The United States Army National Guard should retain four Apache helicopter battalions, the National Commission on the Future of the Army (NCFA) has recommended. In a report released on Jan. 28, the NCFA outlined a compromise between a U.S. Army restructuring plan — which would eliminate all Boeing AH-64 Apache helicopters from the National Guard — and a more expensive National Guard proposal, which would retain six Apache helicopter battalions in the Guard. 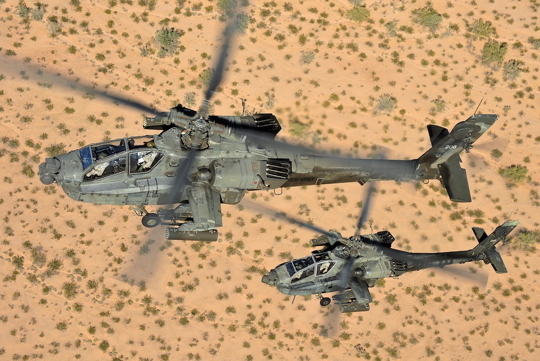 Under the NCFA’s proposed alternative, the active-duty Army would maintain 20 Apache helicopter battalions equipped with 24 aircraft each, while the Guard would keep four battalions, each with 18 aircraft. The Army would commit to using National Guard battalions regularly, mobilizing and deploying them in peacetime. The NCFA was established by the National Defense Authorization Act for Fiscal Year 2015 to assess the size and force structure of the Army’s active and reserve components. It was specifically tasked with examining the transfer of Army National Guard AH-64 Apache attack helicopters from the National Guard to the regular Army, after the Army’s proposed Aviation Restructure Initiative prompted bitter protests from states and Guard units. In exchange for Apaches, the Aviation Restructure Initiative would provide the Guard with Sikorsky UH-60 Black Hawk helicopters. When fully implemented, the initiative would result in a net reduction of 798 rotary-wing aircraft across the Army, Army National Guard, and Army Reserve. The NCFA described the Aviation Restructure Initiative as “a well-crafted plan that holds down costs while maintaining a reasonable level of wartime capacity.” However, the commission noted that it provides no wartime surge capacity for Apache aircraft, and leaves no reserve component backup in case of peacetime problems. In response to the Aviation Restructure Initiative, the Guard proposed its own plan, which would keep six Apache helicopter battalions in the Guard, two of those in multicomponent aviation brigades that would have one Apache battalion from the regular Army and one from the Guard. The Guard’s plan would provide significant wartime surge capacity, but it would also be expensive, as a recent Government Accountability Office report pointed out. And the NCFA noted that the Guard’s alternative provides less wartime capacity than the Aviation Restructure Initiative, with greater shortfalls early in conflict. The NCFA’s recommended third alternative would also add to costs, with operating costs increasing by a net of about $165 million a year, in addition to one-time costs of about $420 million to remanufacture 24 Apache helicopters from D to E models. However, the commission said that “these added operating and procurement costs are small compared to the total defense budget.” And it suggested several ways in which those costs might be offset, such as through a modest slowdown in the procurement program for Black Hawk helicopters.